This line as spoken in F. Scott Fitzgerald's pithy and self-reflecting essay, "The Crack-Up", should remind us in these times of increasing polarization to realize while heatedly debating other's opposing viewpoints that one should maintain dignity and respect for that viewpoint and the person expressing it. Those of us who follow the computer industry fully realize the effects of polarization as we read, view, discuss, and openly debate, in sometimes-heated fashion, the merits of each manufacturer's products. This typically leads into discussions regarding Intel versus AMD, NVIDIA versus ATI, Linux versus Windows, Asus versus Gigabyte, PC versus Mac, and so forth until at times our opinions are so one-sided that we fail to recognize the merits of the other product or more importantly, the ability to respect another's opinion. I have to be honest with you in regards to this article and the products that we are reviewing today. As a devoted computer enthusiast, I fully admit the thought of reviewing the boards included in this article did not excite me, not because of the manufacturers involved, but rather due to the Intel 945 chipset. It has certainly sold in the hundreds of thousands from the likes of Dell, Hewlett-Packard, and others, but unless someone was standing on the street corner praising the virtues of this chipset would you really care about it. I mean, here we have a chipset that is an excellent follow up to the Intel 915, offers the latest technology, provides very good performance for the dollar, is available in a myriad of configurations, and simply does what it is asked to do without question or issue, but is it enough to change an opinion? It certainly changed our opinion, but probably not for the reasons that one might believe. Today, we are reviewing the Epox 5LDA+GLI, Foxconn 945P7AA-8EKRS2, and Asus P5LD2 Deluxe based on the Intel 945P chipset. All three manufacturers took a slightly different approach to utilizing this chipset with, at times, similar results. 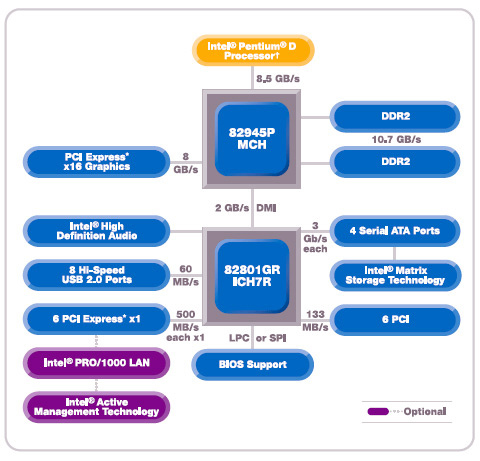 The chart above lists the standard feature set available to manufacturers using the Intel 82945P chipset. Asus chose to augment this feature set with additional SATA II capabilities via the Silicon Image 3132 chipset, additional IDE capabilities via the ITE 8211F chipset, and Firewire 1394a support via the TI TSB43AB22 chipset. Foxconn chose to augment this feature set with additional IDE capabilities via the ITE 8211F chipset, an additional Gigabit LAN port via the Broadcom 8CM5788KF8 PCI chipset, and Firewire 1394a support via the TI TSB43AB22 chipset. Epox took a minimalist approach and augmented this feature set with Firewire 1394a support from VIA with the VT6307 chipset. 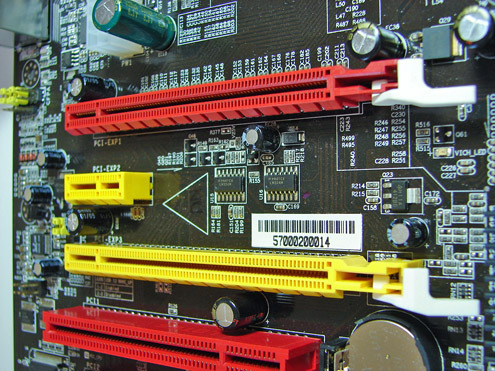 One of the main design features that Asus and Epox engineered into their boards is an additional physical PCI Express x16 slot that runs in PCI Express x4 mode, which enables Intel's Graphic Link Interface (GLI). The first PCI Express x16 slot will continue to operate in full x16 mode while the second PCI Express x16 slot operates in full x4 mode. This allows two PCI Express video cards to be installed allowing quad display capability, and based upon driver support, theoretical performance near the NVIDIA x8SLI design. This additional PCI Express x4 slot runs off the 82081GR (ICH7R) chipset and reduces the available amount of PCI Express x1 slots. Asus took this configuration one step further and offers a BIOS switch which allows the PCI Express x4 slot to run in either x4 or x1 mode. If the user chooses x4 mode, then the single PCI Express x1 slot is disabled. Let's see what these boards are capable of and if one's opinion can be changed. "We will be reviewing additional sound card results in our next article." Could you please include at least one external USB sound card/processor? They are getting more and more available and my thinking is based on the observation that more and more mobo designs are making it hard to plug in PCI cards when you have double width x16 cards. SLId double width cards in the P5N32 (as well as the A8N32, not being tested here) would only leave one pci slot and since I have an ide raid array with at least a year or 2s life in it, that leaves me with no slot for a sound card therefore say, a USB Audigy NX would be useful. This would apply to other people with other cards such as mpeg, extra nics etc... two other boards in the review here (Asus + Epox) leave only 2 pci slots so its still a possibility to offload sound to the usb, provided the performance was not horrible. Could you please include at least one external USB sound card/processor? I completely agree about losing the slots and did not like Asus's AMD layout with both PCI slots in the middle. Due to SLI and CrossFire the available real estate on the board is shrinking rapidly and at this time we know of no PCI-e audio solutions on the horizon. It will be PCI or on-board for a while so proper slot layout or better audio solutions are a must. I have found through repeated testing (over 300 runs) of our BF2 benchmark that the largest impact to the sound results were with the aircraft. We would get frame stuttering with the ALC88x solutions when the aircraft came on screen during the benchmark. However, the sound quality was very good in all games and was quite a surprise after hearing the SB Z2S in comparison (not saying it is better but good enough for most people). I am continuing testing in this area along with headphones and 7.1 output now instead of 2,4, and 5.1 output. Dude, no one argues that sound has no influence on benchmarks. Particularly the case of integrated sound. It makes sense to test the affect of sound when you're testing a motherboard which has on-board sound to see it's impact. Well, see, that's where I go out and read sound card reviews -- to see how much system overhead they require. I pick and choose based on individual price/performance for all the components, which gives me an idea of how the completed system will perform. We clearly have different philosophies for how we select our components, and there's nothing wrong with that. I just happen to prefer the "filtered" performance benchmarks which isolate (as much as possible) the individual components because that provides me with the purest data for making my buying choices. It's then up to me to put all the pieces together in my head, knowing the individual contributions for each component based on reviews for each part.